… at the Bon Voyage Adventure Breakfast! My friend and I had a 7:30 AM Advance Dining Reservation (the restaurant’s opening time). 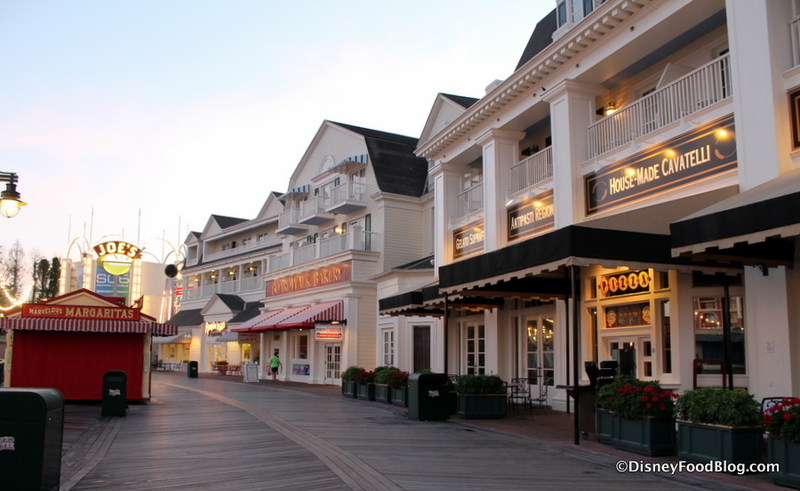 While the Bon Voyage Adventure Breakfast runs until 11:00 AM, the early arrival presented the opportunity to take a few pictures of a pleasantly peaceful Boardwalk in the morning. 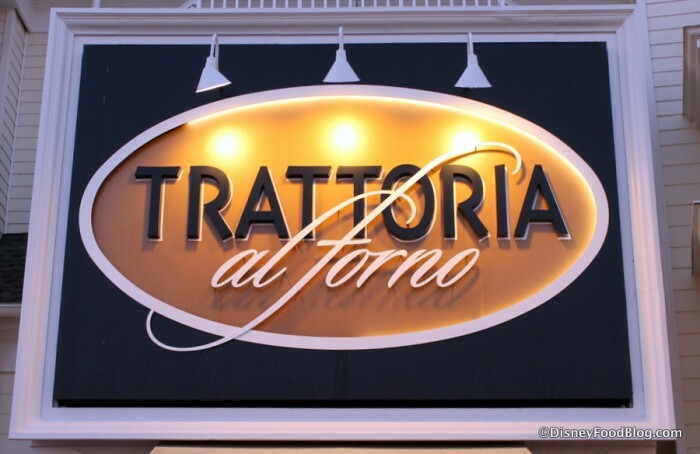 You’ll find Trattoria al Forno, which joined the Boardwalk dining scene in late 2014, tucked between AbracadaBar and the BoardWalk Bakery. 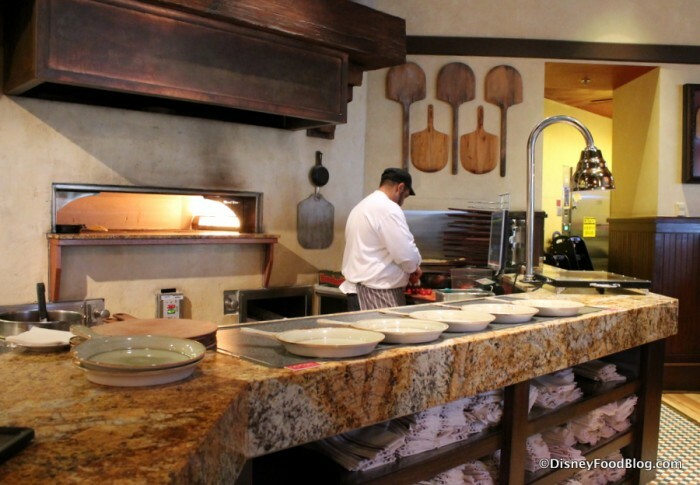 Upon entering the restaurant’s check-in area for the breakfast, you’ll find the scene set for typical day-to-day operations at Trattoria. The only notable addition is a small cart full of Rapunzel and Little Mermaid merchandise. Moving into the main dining area, the atmosphere remains nearly the same as it is for dinner with a couple of exceptions that we’ll mention in a moment. Brick walls, a mix of earthy and deep colors, and plentiful tables (with a few rounded booths for larger parties) set the stage. The exhibition kitchen remains the room’s focal point. 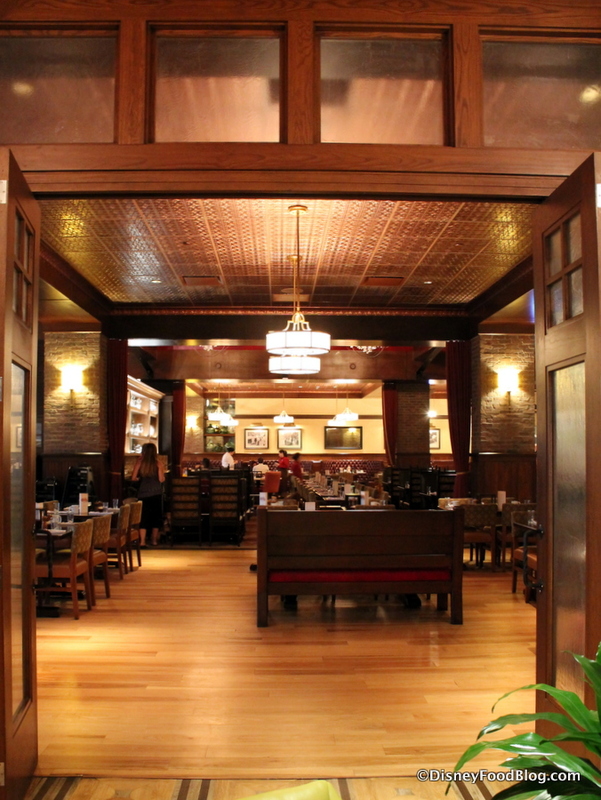 We’re cutting the tour a little short (remember, you can see the entire restaurant here) to focus on how the Bon Voyage Adventure Breakfast differs from dinner at Trattoria. 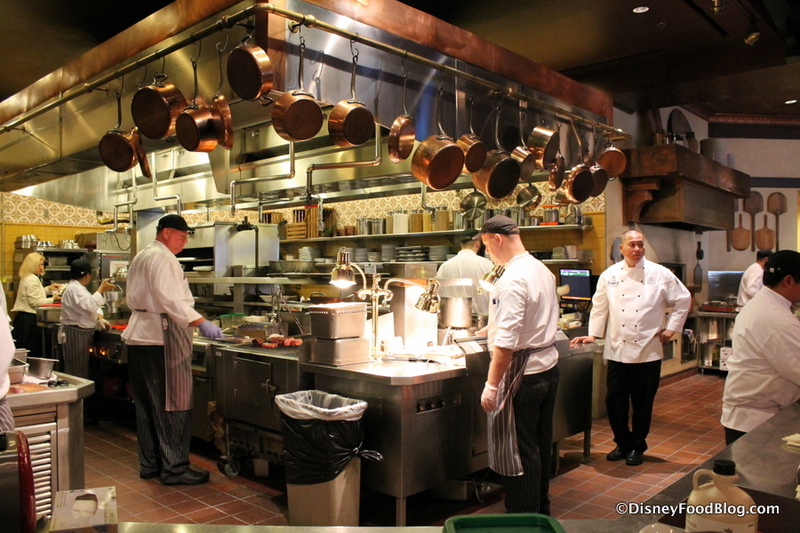 First, the music playing throughout the restaurant really helps to set the mood, as fans of the The Little Mermaid and Rapunzel will recognize the scores of the films setting the tone (no pun intended). Second, as you approach your table you’ll notice something propped in the center. It’s the Bon Voyage Adventure Journal. 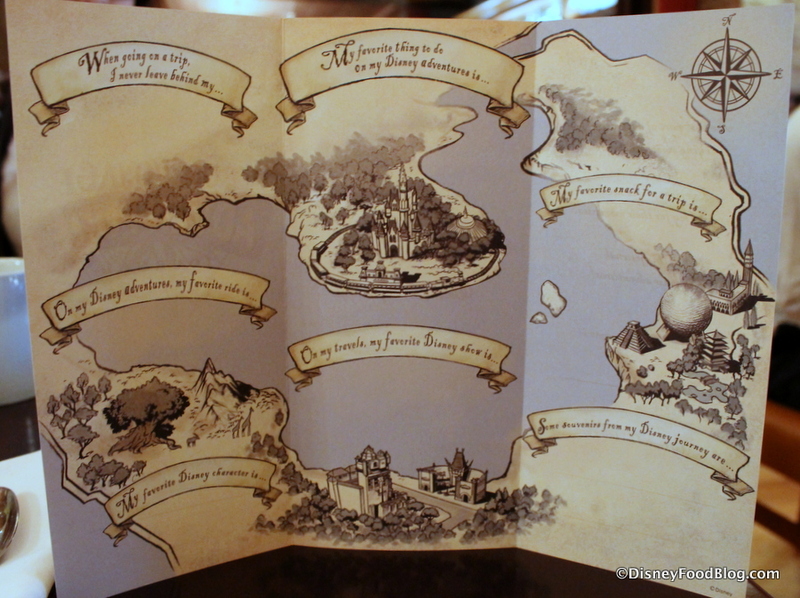 Guests are encouraged to write about the Disney World adventures they’re anticipating for the rest of their trip in this keepsake, or record memories they’ve already made during their vacation (notice all four parks represented in the picture). 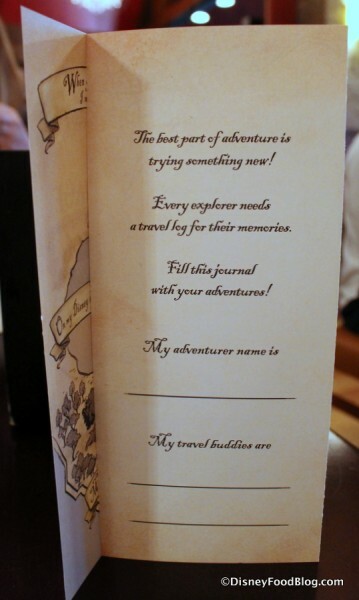 And hence, the “Bon Voyage” theme! The breakfast is ultimately meant to be a great start to the “Best! Day! EVER! 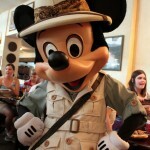 !” before sending you off into the Adventure that will be the rest of your day in Disney World! 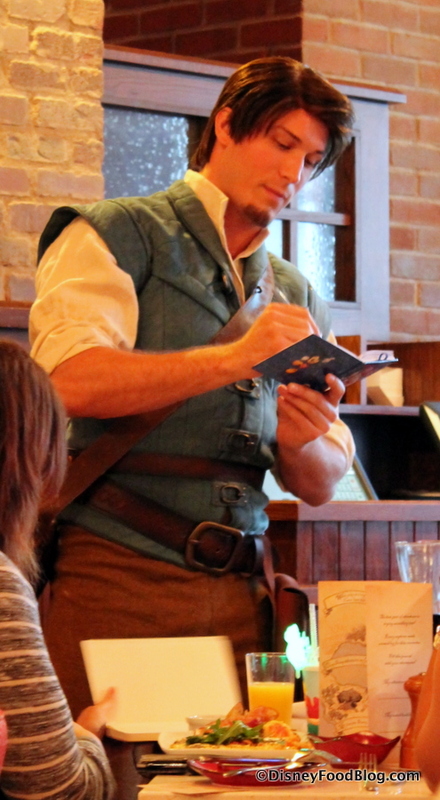 Once we sat down, our server also presented us with autograph cards. 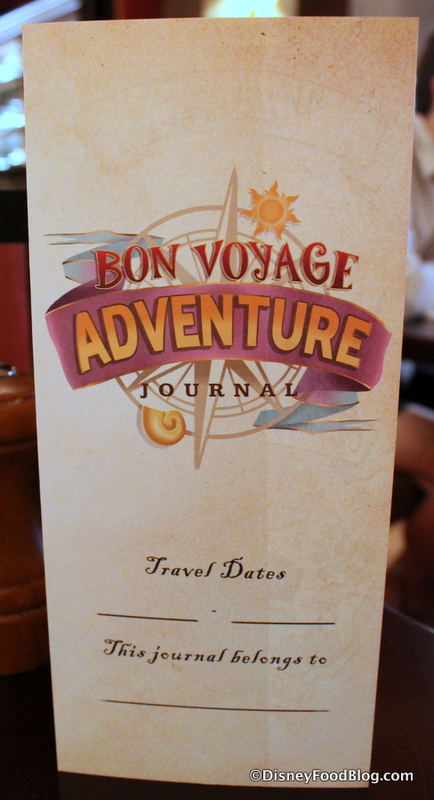 Sometimes an autograph card indicates that the characters themselves will not be signing autographs, but that’s not the case at the Bon Voyage Adventure Breakfast. See? Oh, what’s that? 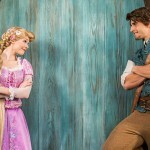 You just got your very first glimpse of FLYNN RIDER?! Well, it won’t be the last… Let’s say “Hello” to our friends! 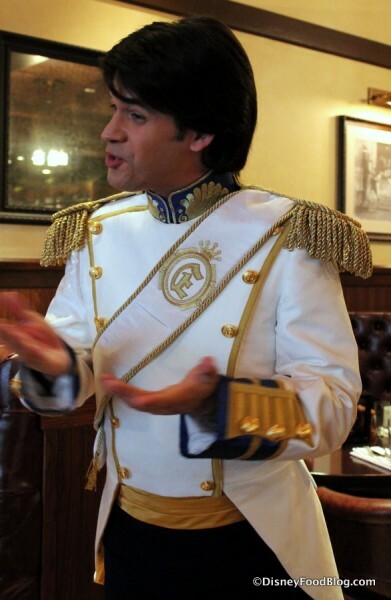 Prince Eric is next, dashing in his royal wear! Even though each character visits each table individually, you know how it is with lovebirds… sometimes they just can’t resist stealing a glance or smile at each other now and then. Again, autograph books are welcome, and photos with the characters are encouraged! And keep in mind that Rapunzel, in particular, will be curious to learn about YOUR dreams, so be sure your little one is ready to share. 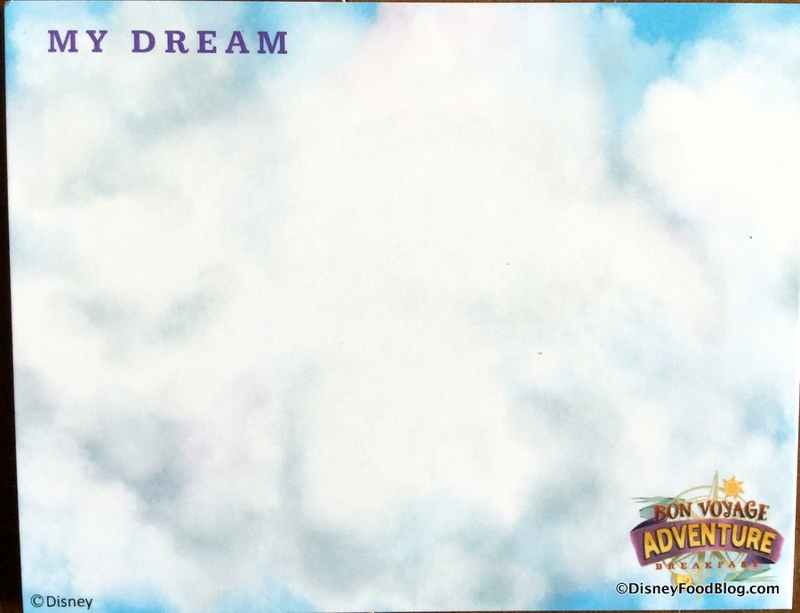 Flynn might even give you a card so you (or your wee little Prince or Princess) can note your dreams to share with Rapunzel when she comes along next. 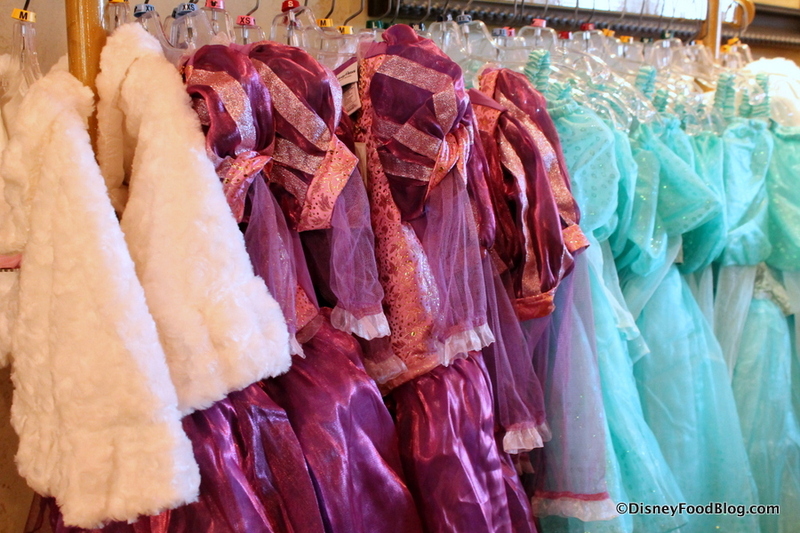 I thought this was a nice touch to help prepare little ones who may be a little shy or even starstruck when Rapunzel comes by. 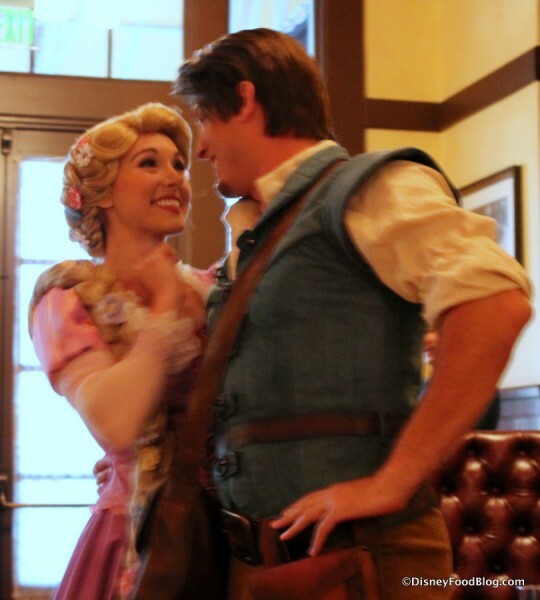 (Not that I would know anything about being starstruck by Rapunzel and Flynn Rider. Purely a guess on my part ;D .) And from what I saw she — along with all the other characters in attendance — was great at focusing on the little ones and drawing them into conversation. That said, my adult friend and I didn’t feel out of place, even though we had nary a kiddo with us. Once the whole gang is assembled, it’s time for something of a Disney Character Breakfast tradition: the Napkin Parade! Ariel leads this one, leading children — and, really, any guest who cares to join — in a jaunt around the restaurant, with the waving of napkins completing the scene. 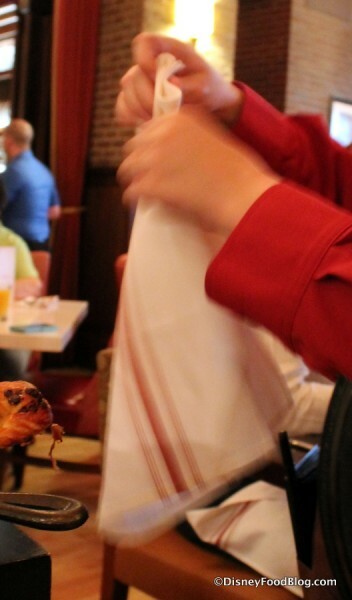 Our server — who was truly attentive, kind, and enthusiastic about this new breakfast opportunity at Trattoria — even gave us a little lesson on some themed napkin folding (i.e., how to make shapes of a clamshell and fish, to fit in with life Under the Sea). And now for some more hot stuff 😉 ! Here comes breakfast! The Bon Voyage Adventure Breakfast offers a menu of prix fixe selections. 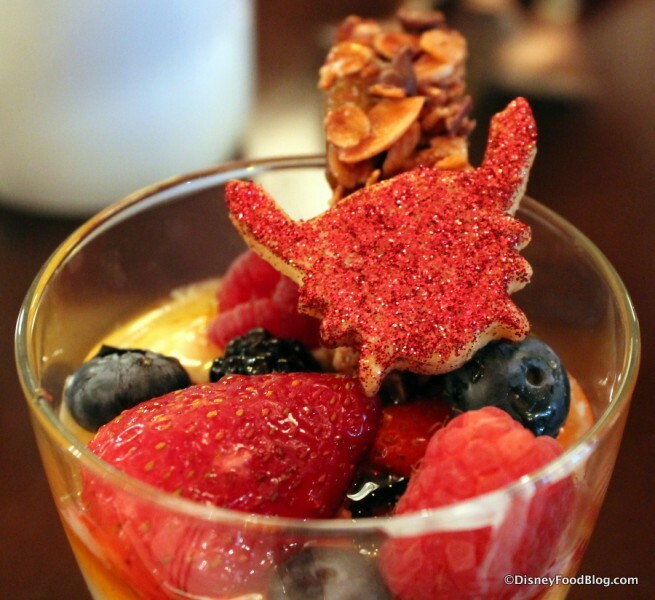 To start, guests receive their choice of Fresh Fruit or a Mixed Berry Parfait, along with a variety of Pastries for the table to share. 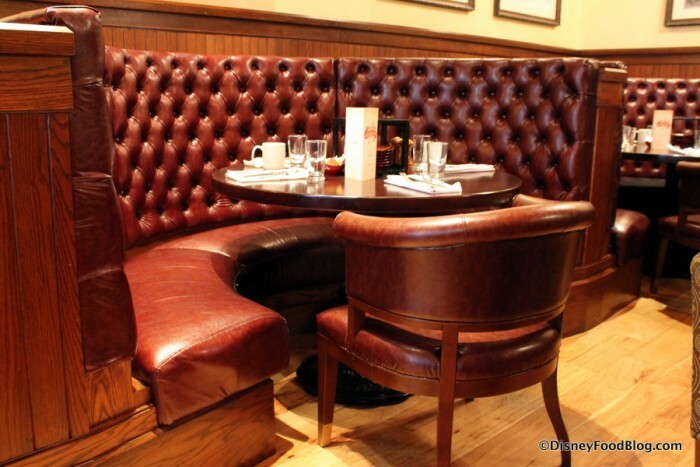 Adults may also add a morning Mimosa, Peach Bellini, Caprese Bloody Mary, or a specialty coffee for an extra charge. Standard non-alcoholic beverages such as milk and juice are included, though oddly we were accidentally charged for our orange juice. We THINK it’s an accident, anyway. We didn’t notice it until after we’d left the restaurant. But just an FYI to check your bill thoroughly! By the way, children can order the Little Mermaid or Buzz Lightyear Punch that’s available in many locations throughout Disney World. 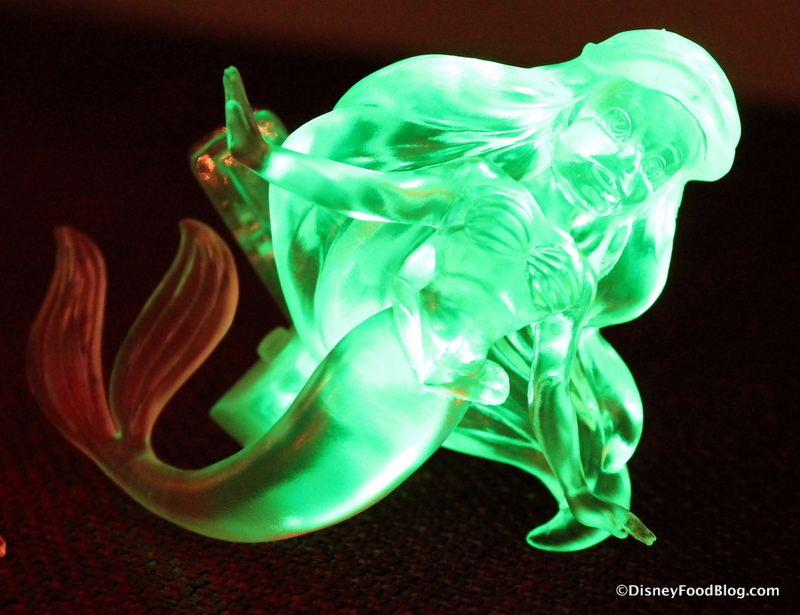 It’s fairly prominent, so you may have already seen the Little Mermaid Clip-on Light that comes with the punch. 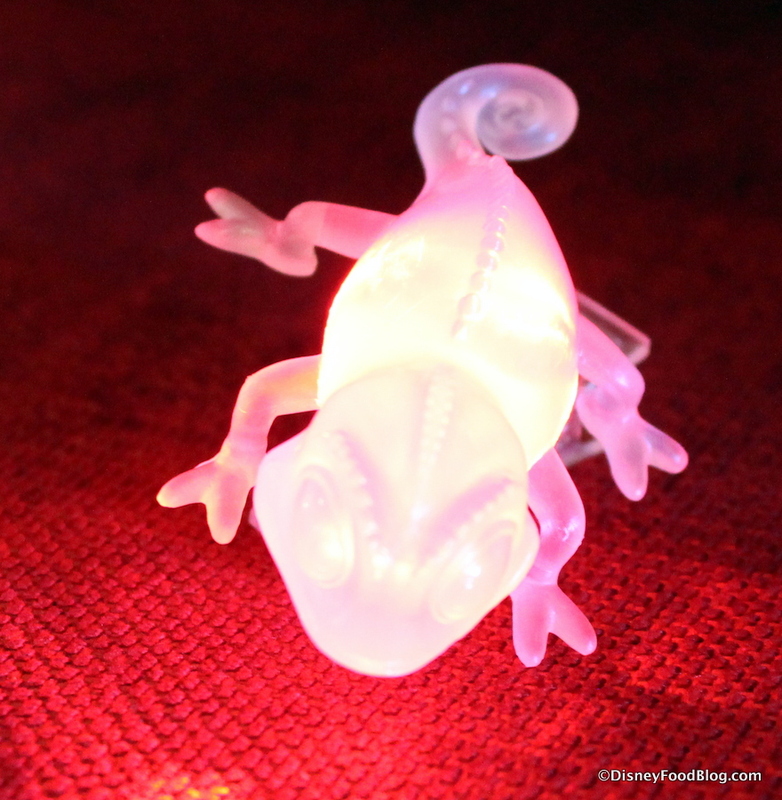 Though the other Clip-on option is typically Buzz Lightyear, it’s this little glowing Pascal at the Bon Voyage Adventure Breakfast! 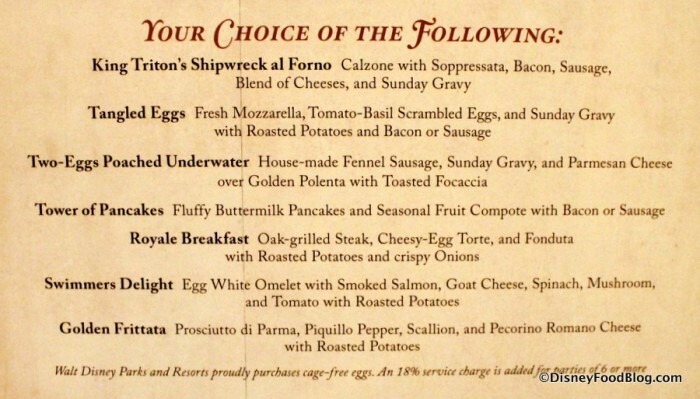 Finally, adults may select from seven entrée choices: King Triton’s Shipwreck al Forno, the Golden Frittata, Tangled Eggs, Two Eggs Poached Under Water, the Tower of Pancakes, the Royale Breakfast, and Swimmers Delight. 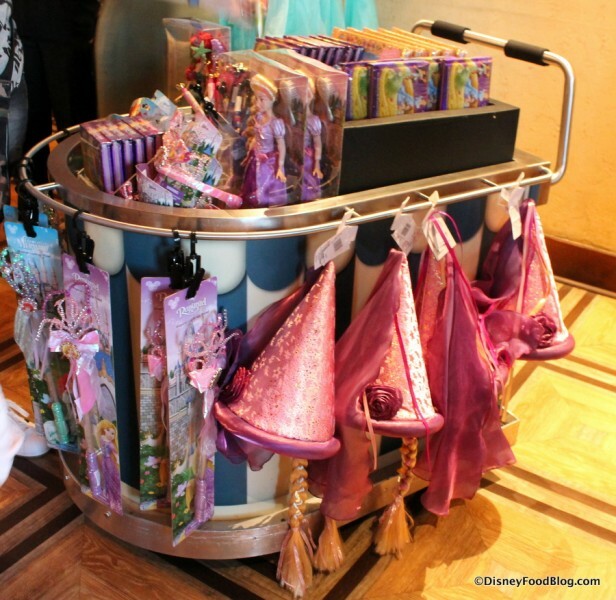 Meanwhile, kiddos have their own options to choose from: Pancakes, a Mickey Waffle, or the Little Royal Breakfast (traditional eggs, bacon, and toast). A note: it’s pretty nice having a Character Breakfast served to the table, as you don’t run the risk of missing a character’s visit as you might at a buffet. Okay, now that you’ve seen the choices, let’s dive in. The starter choices share a couple of things in common. In both cases, the ingredients are fairly basic. 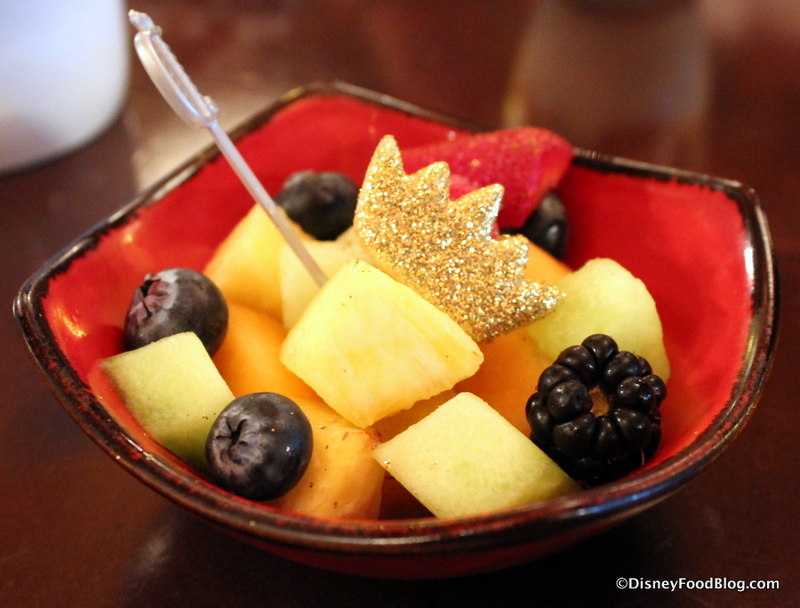 The Fruit Salad, for instance, is simply a very small bowl of pineapple, melon, and mixed berries. But, it has a bit of added charm with the small cookie crown covered in edible glitter. Likewise, the Berry, Yogurt, and Granola Parfait (though I do have to give a nod to the chocolatey, house-made mini granola bar), is also a fairly standard breakfast appetizer. Still, you’ll see a glittering Sebastian cookie peeking out of the top. Additionally, the table receives a selection of Pastries to share. 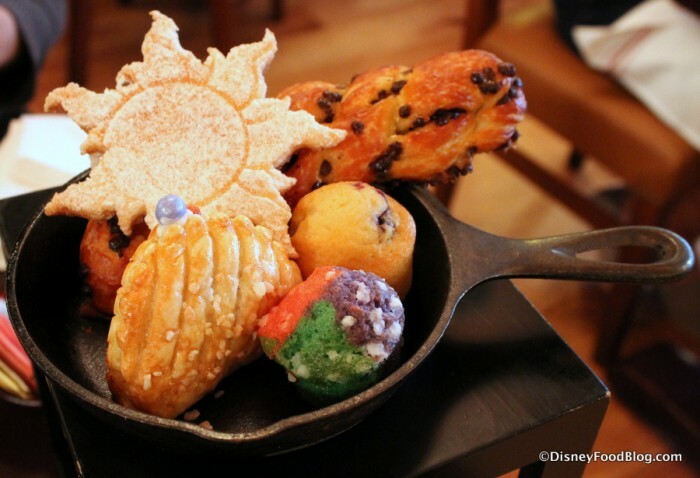 The assortment is presented in a frying pan, which I’m sure Flynn is relieved to see in use as a serving device (as opposed to Rapunzel’s weapon of choice). I’m sure you’ve already noticed that these are not your run of the mill muffins and danish pastries. 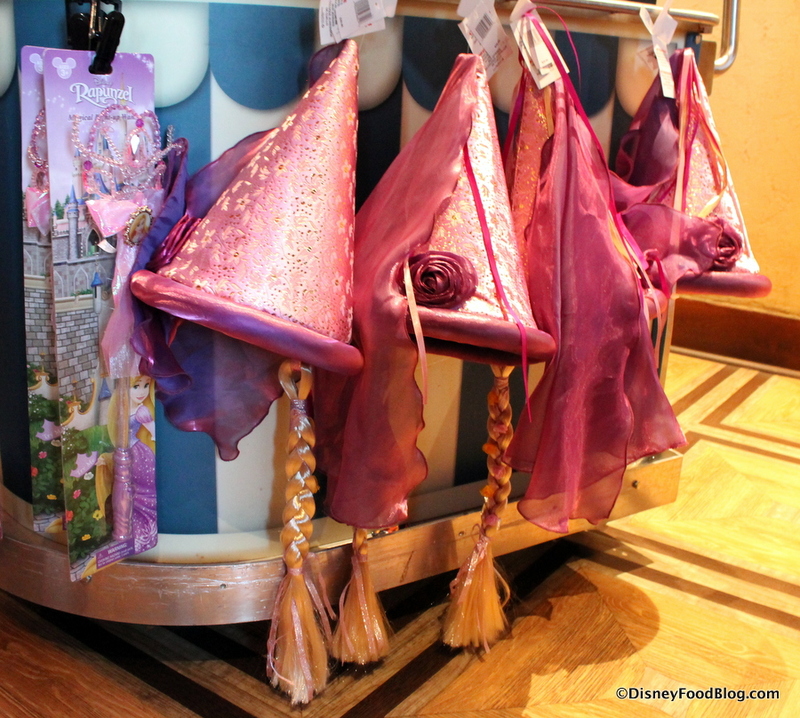 The items are wonderfully themed to the character experience, starting with the Sun Cookie, which perfectly resembles Rapunzel’s paintings. This crunchy cookie brings together buttery pastry layers, powdered sugar, and a hint of almond flavor that tastes as good as it looks. 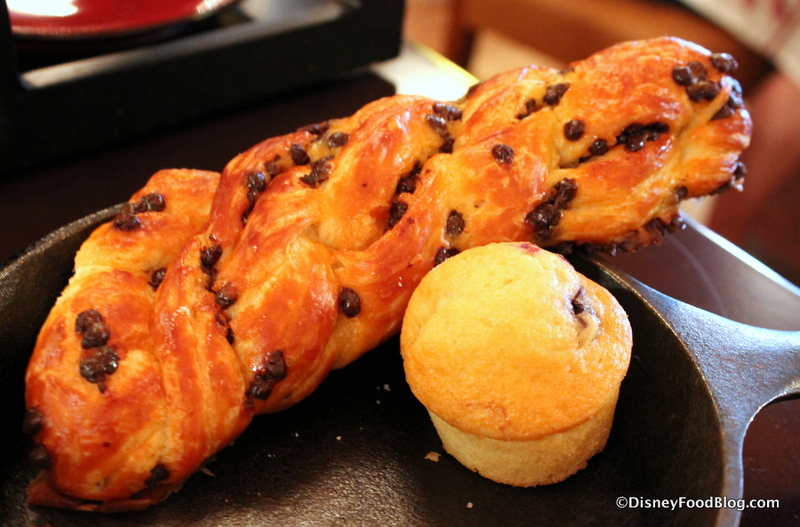 Another signature item among the assortment is the rich, chocolate-filled Braided Bread – another nod to Rapunzel and her golden locks. The Clamshell Pastry, in honor of The Little Mermaid, features a raspberry filling. 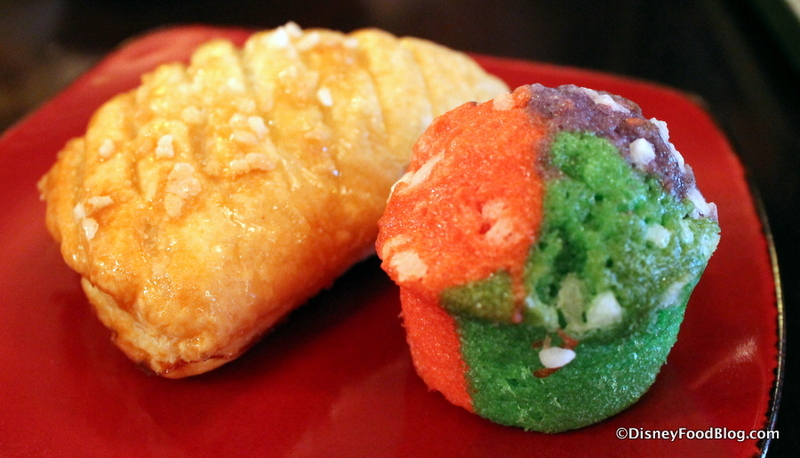 And though the muffin sporting The Little Mermaid’s jewel tones definitely has a unique appearance, it’s actually a simple and moist vanilla muffin. I have to admit, I was a little surprised when we entered the restaurant and didn’t see any extra decorations and such for this particular meal. As it turns out, the food itself is so well themed that it plays its own major role in creating the atmosphere, with one little surprise after another. I know, we usually don’t spend this much time on starters. But can you blame me? Okay, onto the main courses! My friend and I went with one sweet, and one savory entree. The Tower of Pancakes, served with a side of Bacon, is our sweet option. 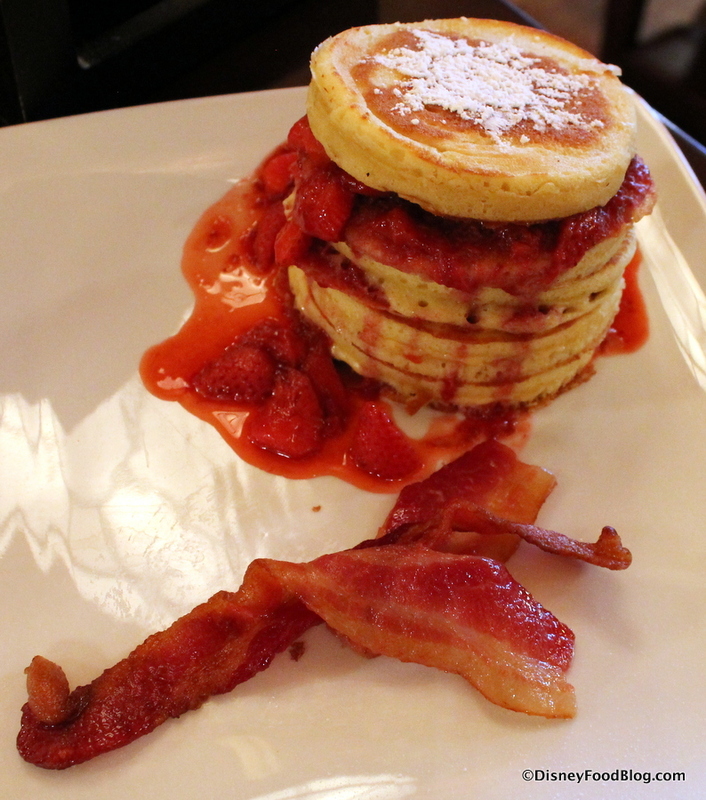 This stack of buttermilk pancakes is layered with a seasonal fruit compote (strawberry, on our visit), and admittedly the photo above is not the best angle, but I wanted to give you a sense of the plating. This close-up on the Tower gives a better idea. 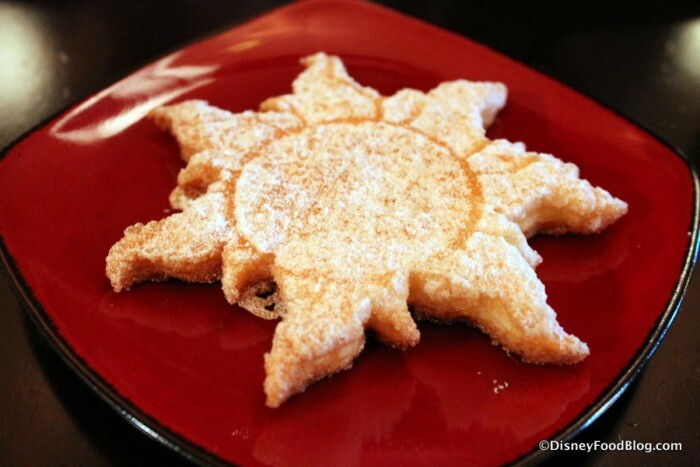 And, yes, that is another Rapunzel-style sun in powdered sugar that you spy on top 🙂 . 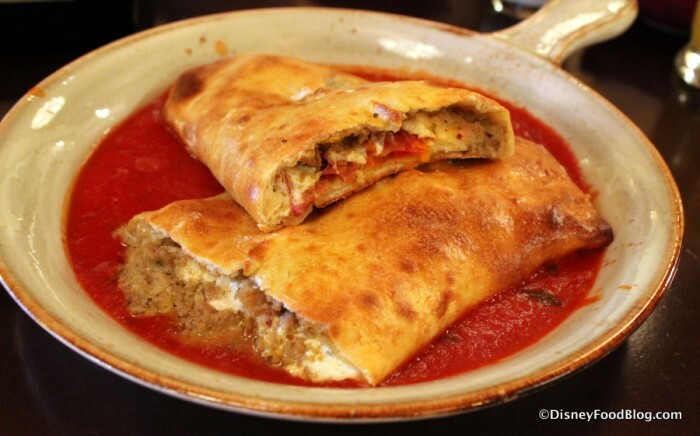 King Triton’s Shipwreck al Forno is a HUGE calzone stuffed with soppressata (an Italian salami), bacon, sausage, and cheeses served atop an Italian Sunday Gravy. 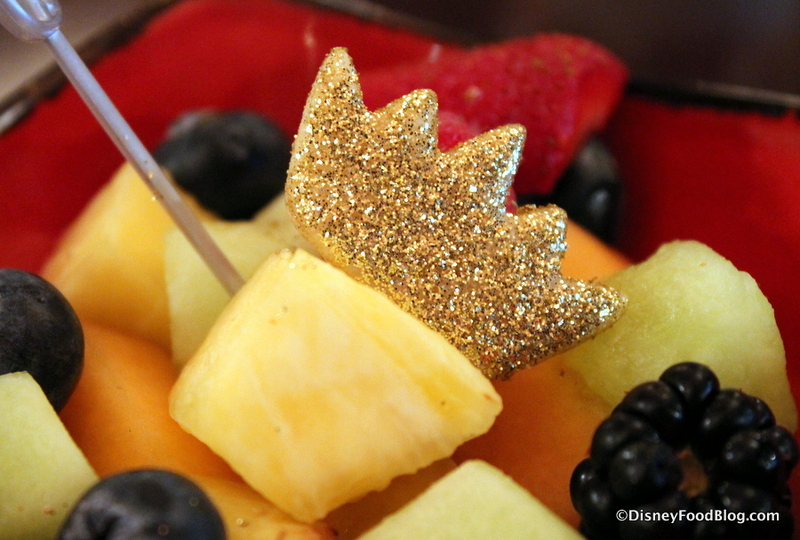 When it is presented at your table, King Triton’s Trident Scepter is holding this enormous pile of food together. Alas, your server removes it upon arrival. Cool touch while it lasts, though! 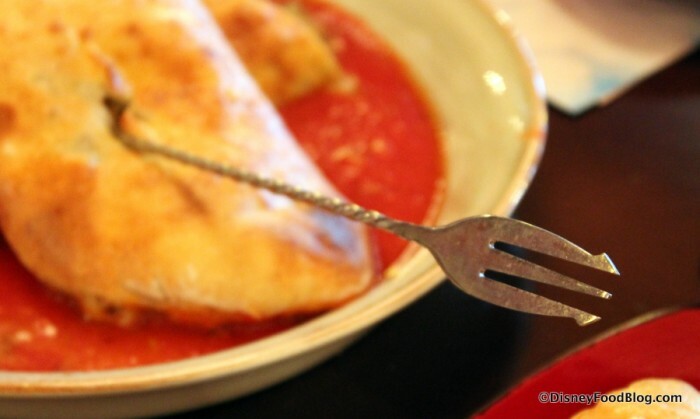 Anyway, while the inclusion of bacon is probably what lands this item on a breakfast list, the emphasis is definitely on the cheese, sausage, golden-brown crust, and flavorful tomato sauce. Which makes it pretty much like eating pizza for breakfast. Which makes it pretty much awesome. I don’t care what time of day it is, this just works. I also like the fact that the Shipwreck gives morning guests the chance to enjoy some of the Trattoria’s Italian fare. My friend and I agreed this is easily an all-day, everyday, thankyouverymuch kind of dish, and neither of us could get enough of it. (Well, technically speaking we could because it’s crazy filling, so we did take home some leftovers. So that’s tonight’s dinner. Or tomorrow’s breakfast. Either way… Hooray!). 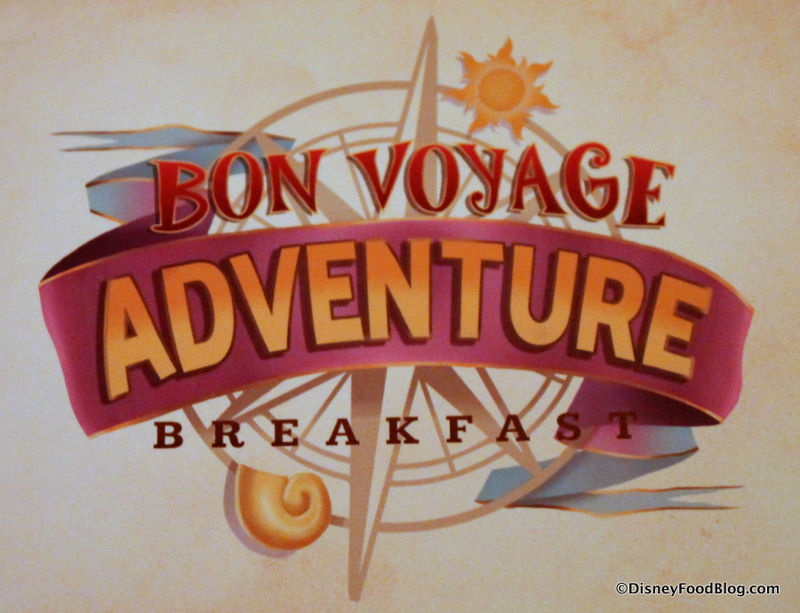 A few notes before we say “Bon Voyage” to you: the fixed price for the Bon Voyage Adventure Breakfast is $34 for adults and $20 for children ages 3-9, or 1 Table Service Credit on the Disney Dining Plan. 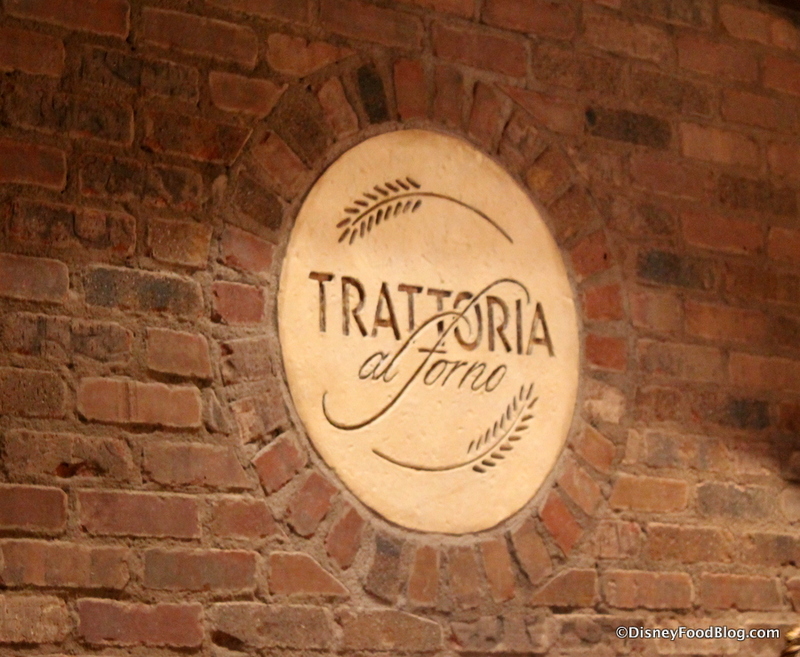 When coordinating a visit to the breakfast with your park touring plans, it’s handy to know that Trattoria al Forno is within easy walking distance to Epcot from its location on the Boardwalk (boat transportation to the park is also provided). For those of you staying at or around the BoardWalk, we were told that Trattoria’s outdoor tables will be reserved for those who’d like to dine there for breakfast but aren’t interested in character interaction. The menu will be the same, though. 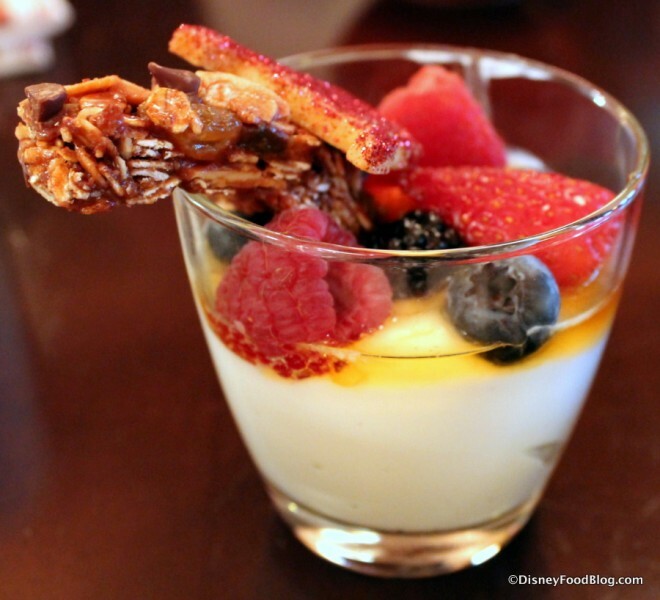 Which brings me to my biggest CON when it comes to this new addition to Trattoria al Forno: with the Bon Voyage Character Breakfast, we’ve lost one of my favorite breakfast items on property — the waffles with mascarpone cheese. A holdover from Kouzzina, this gorgeous dish was amazing. So I bid it farewell with sorrow in my heart. 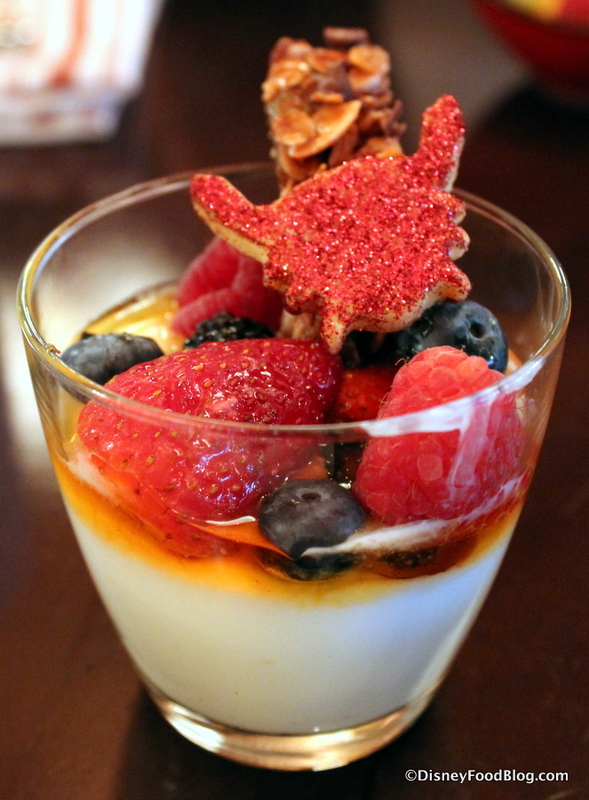 But I’m glad that there are some indulgent dishes replacing it. I think the Bon Voyage Adventure Breakfast is a terrific addition to Trattoria al Forno, the Boardwalk, and Disney Character Meals in general. All the elements are there: good interaction with fun, unique characters (you can’t catch Flynn Rider or Prince Eric just anywhere) in a nice setting with a menu that has clearly had a lot of thought put into it. We learned from our server that the hope is to provide a terrific start to a day full of Disney adventure, and I’d have to say, I think the Bon Voyage Adventure Breakfast succeeds in meeting that goal. Would you like to have breakfast with Rapunzel, Flynn Rider, Prince Eric, and Ariel? Please let us know with a comment! That looks like a blast!! I was wondering if you saw an allergy menu for adults? We have a severe dairy allergy in the family, and it seems like the options on the menu all have (or I would suspect they have) some kind of dairy. I’ll still be making a reservation for this for our next trip, but it’s always nice to see an allergy​menu to make sure everyone gets what they like. Thanks!! I saw nothing vegetarian or vegan. 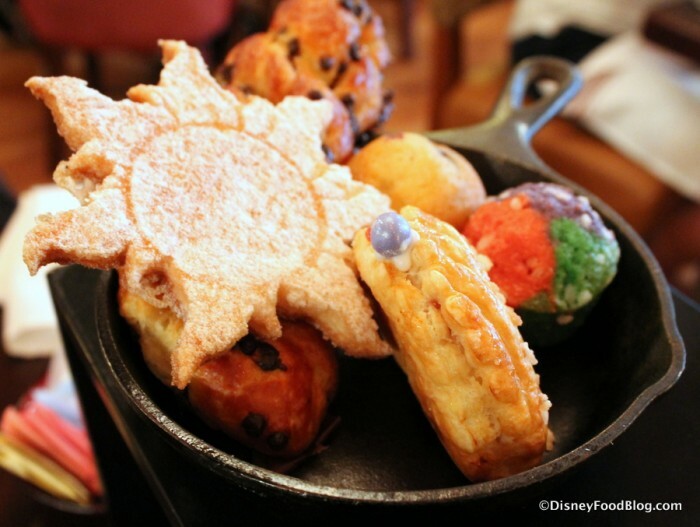 The Bon Voyage Character Breakfast looks wonderful! Thank you for the pics and the review! 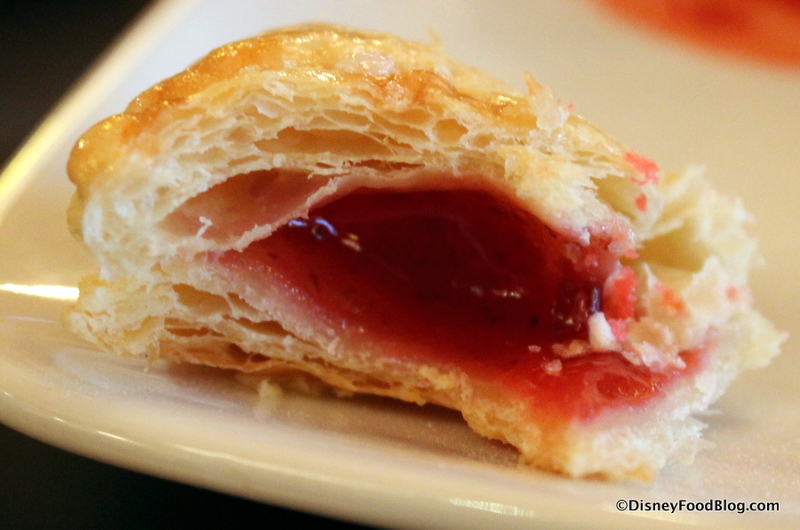 We visited Disney World over Spring Break and this breakfast wasn’t offered at the time. :(. We look forward to another visit as this is on our bucket list. My daughter is a teen now, but Rapunzel is still her favorite! The pancakes look delicious and the powdered sugar sun on top really adds a lot to the presentation. 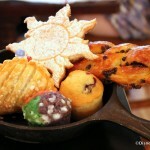 The sun cookie with the pastries is great too! Thanks for the great review! Do you know if they have gluten friendly options? Thanks for your wonderful blogs-I love reading them. I have been trying to snag ADRs since this was announced. 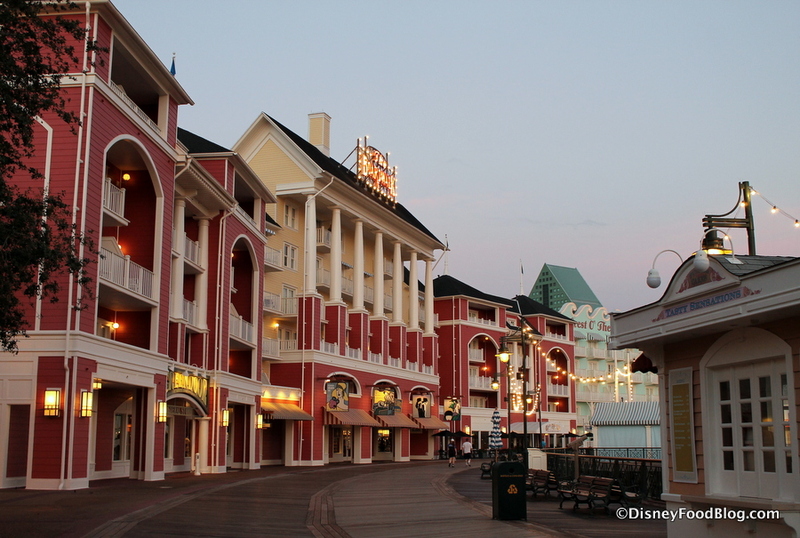 I thought it would be great for the day we check out of the Boardwalk. Sadly, I haven’t been able to procure a table yet. Now, however, I’m really interested in the non-character tables outside. Do you know if there are different prices if you don’t dine inside with the characters? Can’t wait! Booked for June 2nd. It’s a surprise for my daughter. She doesn’t know this even exists. She’s been to almost every other character meal at WDW. She LOVES Rapunzel and Flynn Ryder so this will just make her day! Looks like fun and good food as well. 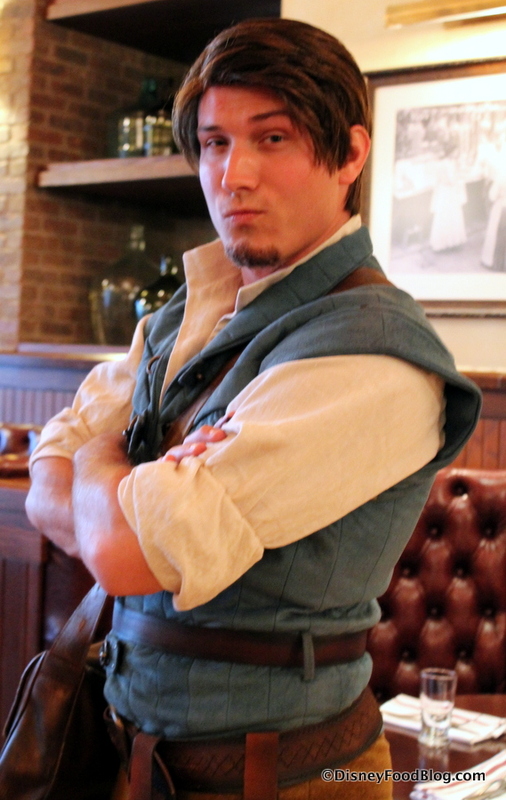 I’m so glad that you included the Smolder!!!! Will be staying at the Boardwalk the last week of April with the whole family. 3 grandchildren included. 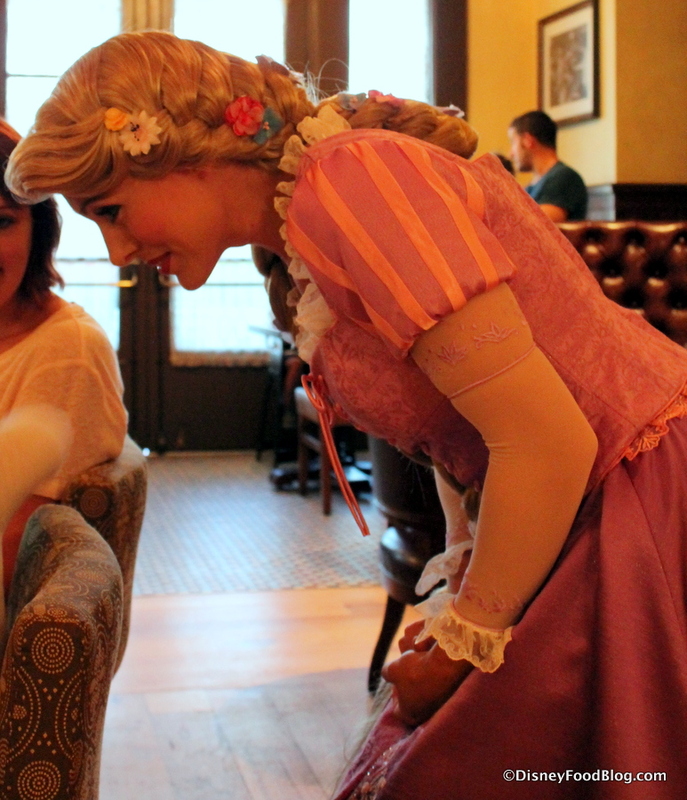 Rapunzel is one grandchild’s favorite princess. Been trying to get a reservation to no avail. Any tips on how to get one would be appreciated. 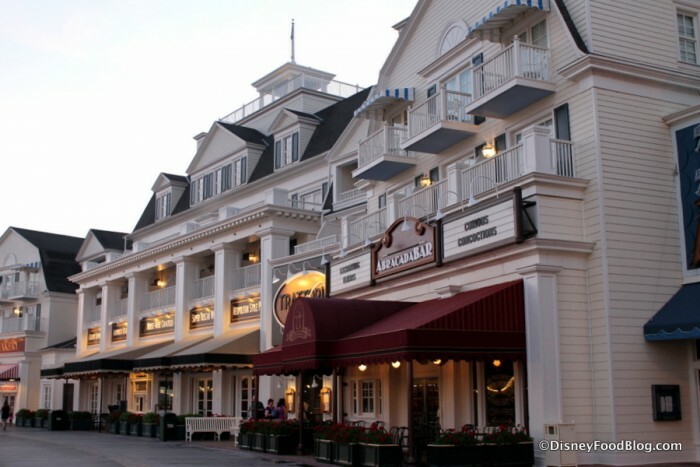 We are also DVC members id there are any perks there. Heck Yes!, Punzie’s my favorite princess, and I’m totally asking very nicely for these characters to autograph, despite getting a pre signed card!, and also I would get the The pancakes, and I would also have dibs on the Rapunzel sun cookie and the red, green, and purple muffin! Christ, how awful. Dumb down the menu, crank up the price, and fill the place with shrieking junior psychotics. There goes the best breakfast on that end of property. Dr. Leonid K Squid…… If you didn’t realize it, Disney and its resorts are for families and that will include kids from time to time. If you don’t want to have to deal with kids you should probably go somewhere other than disney. You sound like a cranky old curmudgeon who yells at kids walking on the grass. Check into an old folks home already. 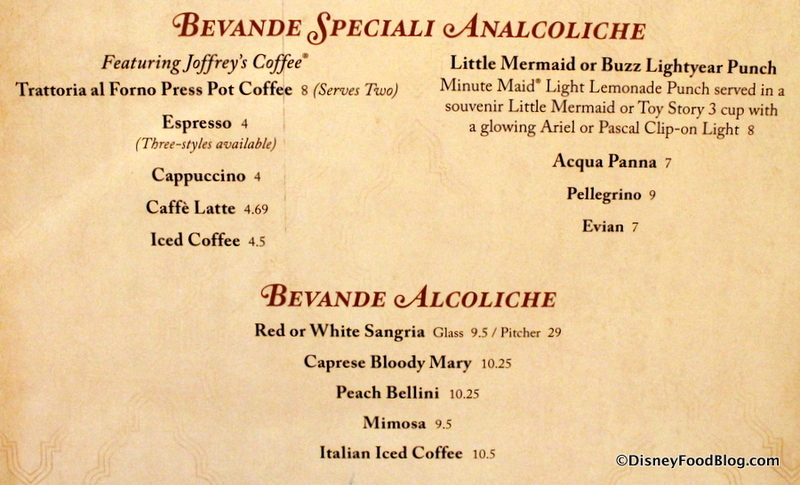 I’m so glad this turned out to be something special with the food options and not just a generic breakfast menu. Thanks for a great review! 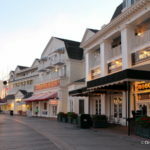 Will be staying on the Boardwalk the last week of April with the 3 grandchildren. Would love to try this restaurant, as have eaten there many times when it was different places. 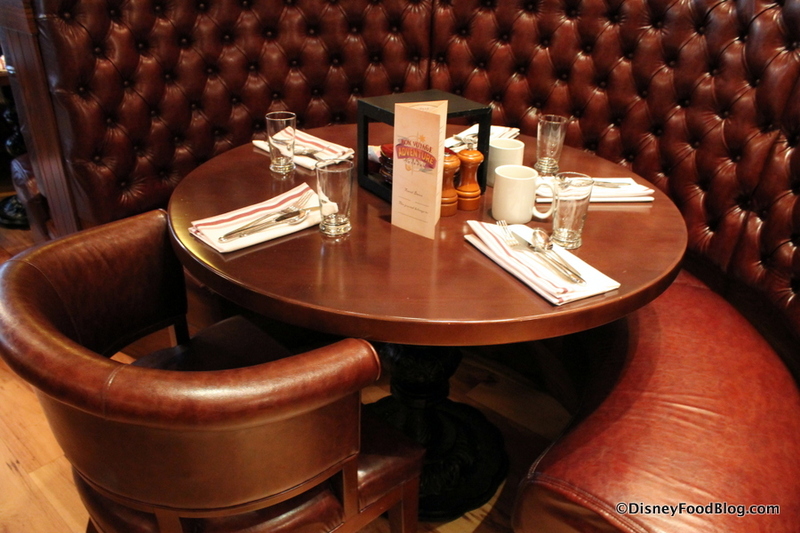 Are reservations hard to get, and are there any discounts, perks for DVC members ? Kim — While we didn’t get photos of it during this visit, Disney normally offers a special Allergies Menu that offers options for guests with food sensitivity, including gluten. Great review! I’m also very excited that there’s another option for a “sitting” character breakfast. The pastries + the smolder look worth it already! Hi there I have a reservation in June, do you know if they offer Annual Passholder discounts? Thanks! Looks great and I love the food choices (although I LOVED Kouzina). I am a little surprised at the number of people who seem to not mind paying character buffet prices for a non “all you can eat” meal. I mean, for the same price, Crystal Palace, for example, gives you 4 characters and a pretty nice buffet. Bob – As far as we know, there is no all-you-care-to-eat component here. Jennifer, I would say if you hold the bacon/sausage the pancakes are more than likely vegetarian (though not vegan.) If the food is actually made fresh, you should be able to also hold the salmon from the egg-white omelette and the bacon/sausage and gravy from the Tangled eggs. I personally, plan to do one of those options. However, I suspect with some notice they can do something vegan. I did the brunch at Naracoosee’s post the Princess 1/2 and they gave me an entire menu of options they can do for dinner for vegetarians/vegans. None of it was on the Disney website. I find some restaurants are better at working with you, while others are not, I’m looking at you Be Our Guest and your lack of options with dinner. Bob, the price is cheaper than Cindy’s which is also not a buffet and while there is a buffet component to Asherkus lunch and dinner, I think that is the less popular part of the meal. 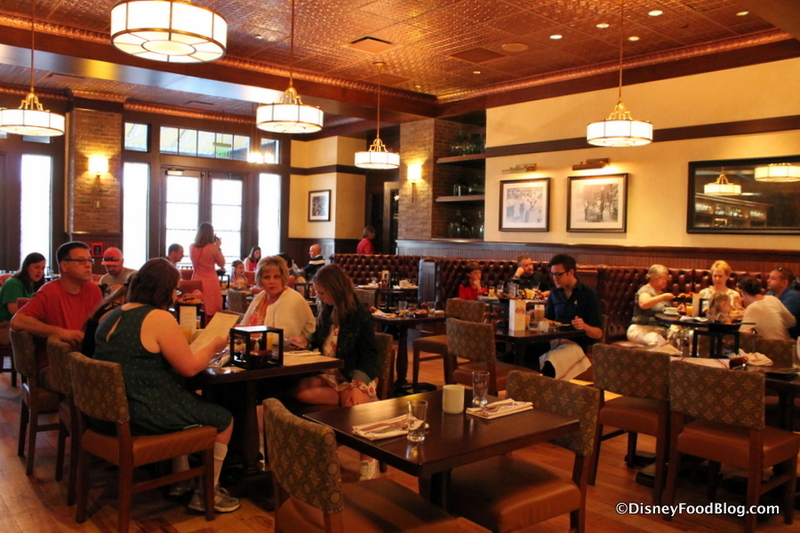 ‘Ohana also has a very limited breakfast menu. Sure you can eat as much as you want, but it’s just scrambled eggs, bacon, Mickey waffles and potatoes. I prefer more variety. I paid extra once to get my daughter a bagel. Personally, considering this place and BoG are now the two hardest places to book, I think Disney must have made the right decision. I wonder if they will make over the dinner too. This is our new favorite character meal. The food was so beautiful and delicious! The characters were wonderful and really interacted with our kids. 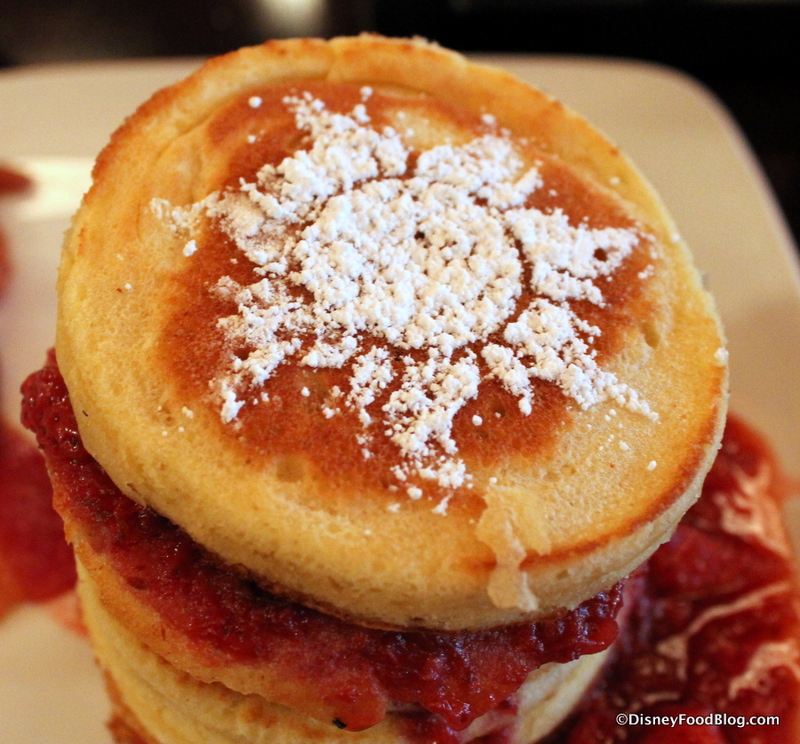 They do have gluten free options…even made some gluten free mickey waffles for our little one! 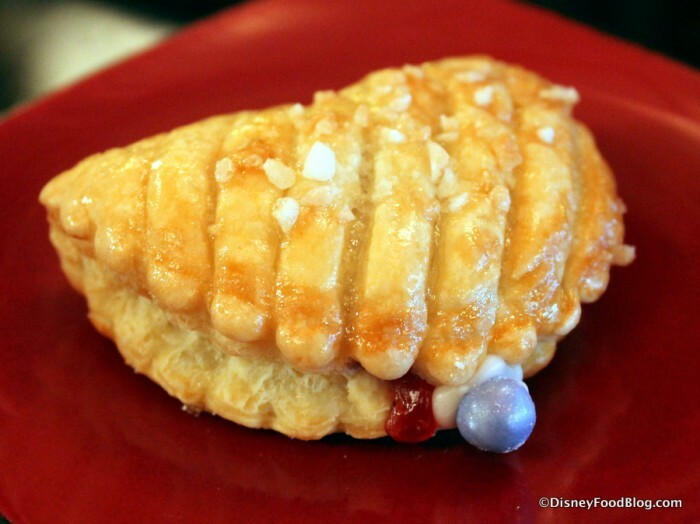 Definitely try the Rapunzel choc chip braided pastry (not gluten free)! My favorite treat of our trip!! Does anyone know if you can get in without a reservation? I have been trying to get a reservation for our trip in November and have had no luck… I even tried 180 days out! These are my 4 year olds two favorite princesses and its one thing we really want to do! Any advice would help! Thank you! Julie — It’s possible. 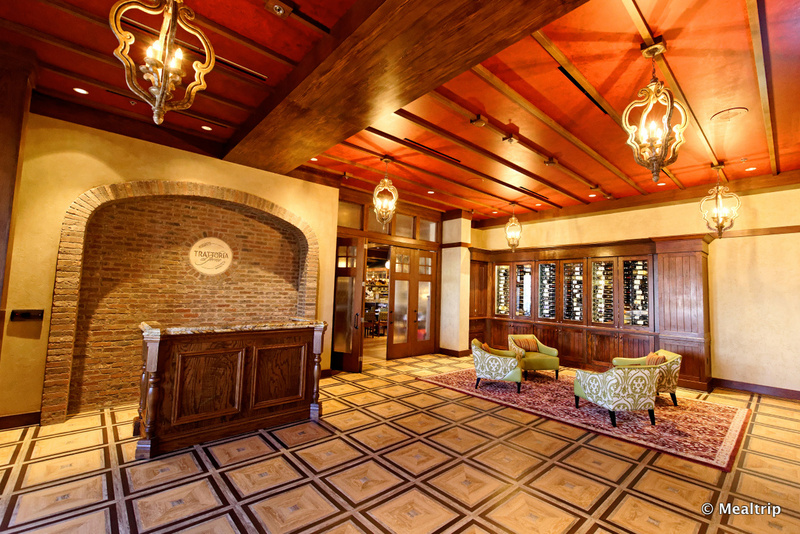 Keep trying for a reservation, and if you’re unable to get one you can always try walking up on the day-of. I think the choices are abysmal for vegetarians and especially for vegans. It’s also a shame they don’t offer the option of NOT having the character option and charging a more reasonable price. $37 is a lot of money in my opinion for what you get. If it was all you can eat that would be more reasonable but I’m afraid as a vegan with more money than sense it’s not for me. I just recently found out about this breakfast but figured being only 3 months AND the beginning of Spring Break Season, we’d be out of luck. Much to my surprise, last night I found late morning ADR on the date of my daughter’s birthday!!! She will be 19 but Rapunzel is her absolutely favorite princess. I’m going to keep this a surprise and she will be thrilled! 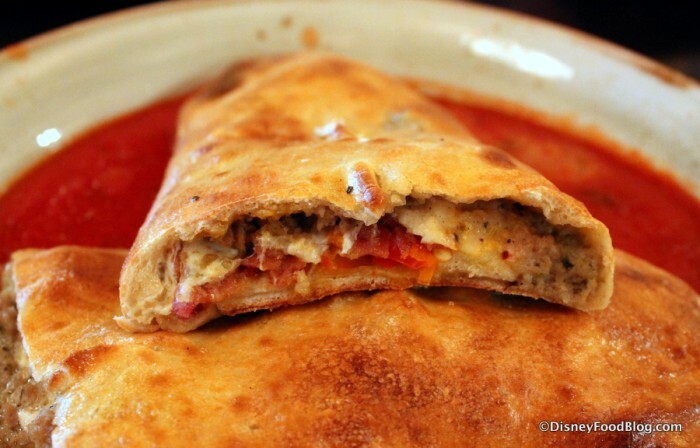 And being late morning that calzone is already calling my name! Carmen — YAY!! Congrats!!! You know, I’m not sure they’ll bring more of the pastries. I would love to find out what your experience is with that. Definitely ask! How long does this early morning breakfast take? We are hoping to get a 7:30 ADR and make it to Hollywood Studios to sign up for Jedi training. Thanks!!!! Beth, the character breakfasts usually take an hour or slightly more. I would love to take my grandchildren here but was unable to get a reservation during our stay. We are staying off grounds and tried daily at 5am. Hi there! I’m looking to reserve a breakfast here. 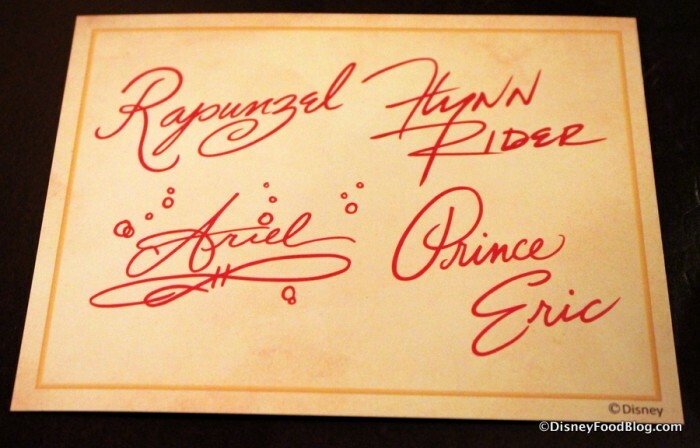 All I’m seeing is 11:00 or 11:55, would Rapunzel and Flynn leave by then? Also what is the best time to reserve, the earlier the better? Mallory, breakfast is scheduled until 1205 at Trattoria al Forno, and they characters will circulate through the end of the meal. The best time to reserve is whatever works best for your schedule! Enjoy! Ashlee, you can feed your under-three-year-old from your plate at table service restaurants. If you wanted to supplement with something else from the menu (or a separate drink, for example), you should expect to be charged for the extras. 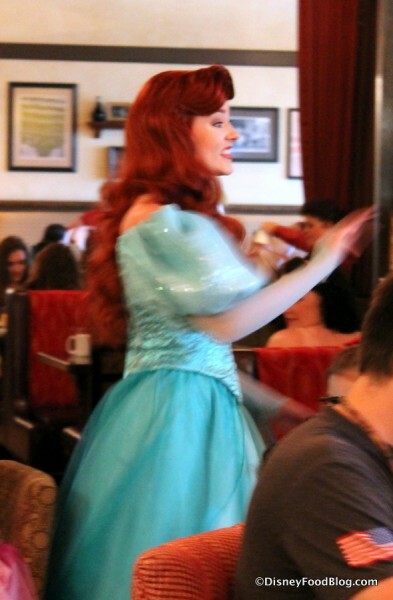 We where there last week for this character breakfast. There are some changes. The breakfast was okay. But you only get the fresh fruit option, no parfait. And no glitter cookie on top. No autographe cards , no dream card and no share your adventure card. The characters where lovely and thats why the experience was there. But at some points it wasn’t worth it. The food is good. 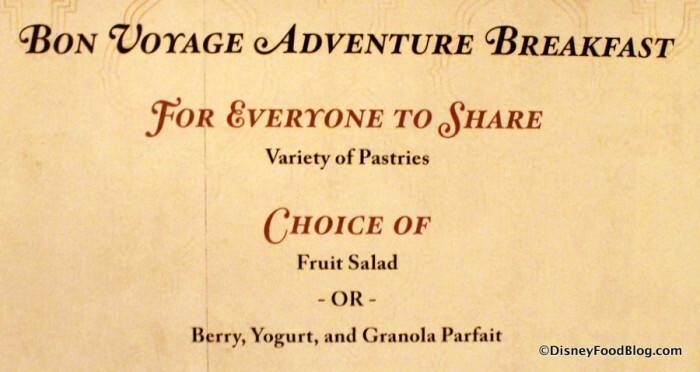 As stated above you only get a fruit salad and the assortment of pastries. What I found nice is they made things not on the menu. We asked for a specific type of omelette and they did it with no hesitation. My granddaughter doesn’t like pork, can she get anything else with the Pancake tower? Linda, you can always request a substitution. We’ve seen options like chicken or turkey sausage (if there’s any in the kitchen) or fruit in place of pork sides.